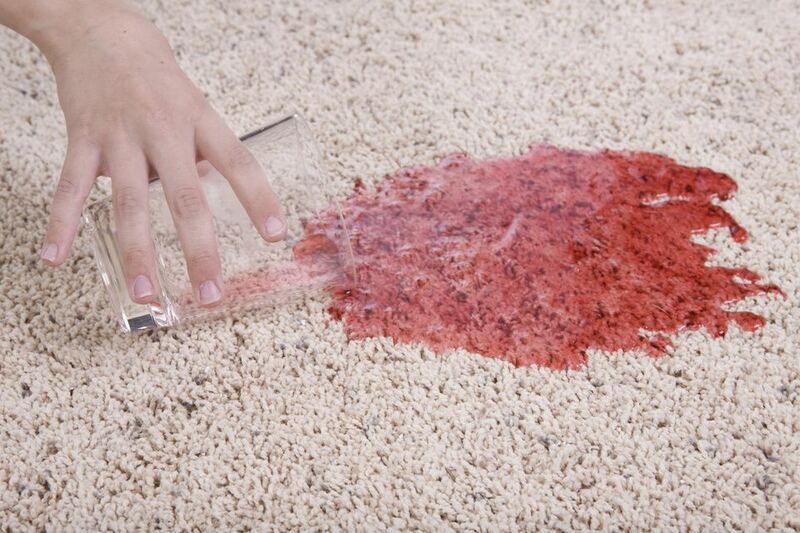 The best time to treat a stain is as soon as possible before it has a chance to soak into the carpet. Of course, sometimes this isn't possible—perhaps you arrive home and find that your pet had an accident while you were out, or you discover a spill long after the party guests have left. Don't be dismayed; while it may be a bit more difficult to treat a stain that is not fresh, it is still possible to remove it. First, scoop off any solid matter left on the carpet from the spill (food, pet accident, vomit, etc.). Then, using a plain white towel or paper towels, blot up as much of the stain as you can. Place the towel on the stain and put pressure on it to absorb the spill. When the towel is saturated, move to a clean spot on the towel and blot again. Repeat this process until there is no more transfer of the stain to the towel (i.e., when you can no longer see any trace of the stain on the towel). Before applying a cleaning solution, try first pouring a small amount (depending on the size of your stain, but likely no more than 1/4 cup) of lukewarm water on the area. This will help to release some of the spill, especially if it has been sitting for a while; it could even be all that is required, depending on the nature of the spill and the type of fiber. Blot this water up using a white towel or paper towel until there is no more transfer to the towel. If the stain remains on the carpet, proceed as below. Mix one cup of lukewarm water with 2-3 drops of clear dishwashing liquid. Do not add more dish soap than this! Adding too much will result in a residue left behind on your carpet. Tip the bottle of dish soap and squeeze very gently until a single drop comes out; repeat once or twice only. It is very important that you use a clear liquid soap; any color additives could potentially stain the carpet. Clear Dawn is a good option, but you can use any brand, so long as it is colorless. Dip a clean white towel or paper towel into the water/soap mixture, and gently blot at the stain with it. Start at the outside of the spot and work towards the center, to prevent spreading the stain. Dab at the stain using gentle pressure, but do not scrub. While it may be tempting to scour the carpet, this will seriously damage your carpet. Scrubbing will cause the fibers of the carpet to untwist. In both looped and cut pile carpets, this will create a fuzzy, worn out appearance, which will leave your carpet looking worse than it did with the stain. For this reason, do not use a scrub brush or toothbrush to clean your carpet. Continue to rub the spot with the towel carefully. If you are finding that you are unable to reach the deepest part of the carpet, then use your fingers to gently agitate the fibers and coat them in the cleaning solution. When you have finished treating the spot, use a dry white towel or paper towels to blot up as much of the cleaning solution as possible (follow the above instructions for blotting again). Finish off your treatment by pouring some cool plain water on the spot to rinse off any soap left behind (approximately 1/4 cup). Again, blot up this water until the carpet is just about dry. If the stain reappears, it may have soaked further into the carpet backing or underpaid, and caused wicking. Repeat cleaning procedure as necessary. Sometimes, despite our best efforts, a stronger cleaning product is needed to remove the stain fully. There are many spot treatment products available on the market. Check out these reviews of the following brands, and see which one will work best for you. Why Do Some Carpet Stains Come Back After You Clean Them? Can Urine Off Really Remove Odors and Stains?